I never used to like cauliflower. But cauliflower seems to have become trendy recently – some people swap unhealthy white rice for healthy cooked, grated cauliflower and claim you can’t tell the difference between the two. There are all these different methods of cooking – grate and steam or cook briefly, or grate and fry, adding this, that and the other. Hmm, it still didn’t sound very attractive to me, it was still cauliflower. But my curiosity took over and I had to try. Wow! Double-wow! Super-delicious! What a revelation – I am most definitely a convert to cauliflower cooked this way. 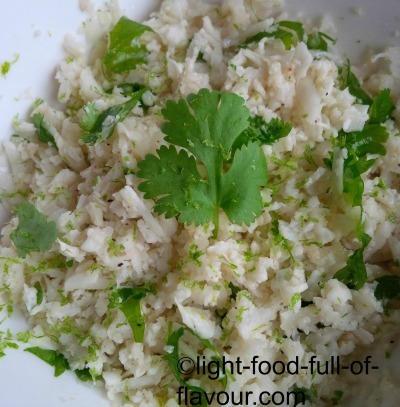 No, it doesn’t taste like rice but it tastes fantastic and can easily replace rice for a variety of dishes. It's the perfect accompaniment to a curry - to most types of Asian-style food actually. To avoid losing all the healthy nutrients in the cauliflower, only fry it for a couple of minutes and fry in ultra-healthy and tasty coconut oil (this oil really adds to the taste of the rice). This will give you an al-dente texture. Although I love fresh coriander/cilantro myself, I know that some people can't stand the taste of it. 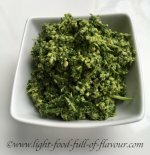 If you are one of them you can use some chopped parsley or some finely chopped spring onion (scallion) instead. It's a good idea to prepare the ingredients for the cauliflower rice in advance as it cooks so quickly. Cook it at the last minute once the food you are serving it with is ready. 1 large head of cauliflower - coarsely grated. I use the coarse side of an ordinary handheld grater which I place over a large bowl. Add the coconut oil to a wok or a large frying pan over a medium high heat. Once the oil is hot, add the grated cauliflower to the pan and season with some sea salt and black pepper. Use two spatulas and keep stir-frying the cauliflower rice for about 2 minutes (it will be al-dente). Take the pan off the heat and stir in the chopped coriander (cilantro) and lime zest or juice. Serve immediately. If you like this recipe, then you might also like Oven-Roasted Cauliflower Salad.